Due to monitor settings,monitor pixel definitions,we cannot guarantee that the color you see on your screen as an exact color of the product. We strive to make our colors as accurate as possible. Colors are approximations of actual colors. Material: Cotton Blending. Condition: 100% Brand New with Tag. Season: Autumn, Spring, Summer. Using the Size Chart as a reference, a size up or down from there (if necessary) will get you to the right fit.If child is heavier or stronger, please consider to choose bigger size instead suggested size! Please allow 1-3cm differs due to manual measurement, All measurement in cm and please note 1cm=0.39inch . 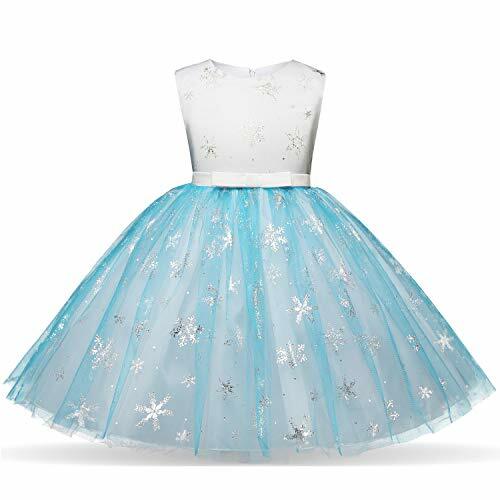 Elegant combination of blue and white color, a stylish princess dress. Suitable for birthday party, photograph, taking photo, party, holidays, wedding, ceremony, Halloween, Christmas, Valentine's day, gift giving, dancing, trips, family events, garden parties, beach, etc. Suitable for wedding party, holiday party, First Communion, ceremony, baptism, birthday, pageant, artistic photo shoot etc. Sleeveless, a non-detachable small lovely bow decorated in front of the waist, with blue tulle hem. The whole skirt is covered with snowflake sequins, looks more lovely. the dress with concise and fashion, simple yet elegant, making your girl shining in the crowd. Size Table means age ranges for girl 2-8 Years, but they are for general guidance only. For most accurate fit, we recommend checking detailed measurement before purchase. If you have any questions about this product by ZerYoYus, contact us by completing and submitting the form below. If you are looking for a specif part number, please include it with your message.